The Power of Myths reminds me of the classic children’s story “Little Red Riding Hood” it has almost all the main features of one stereotyped image of a grandparent. Once upon a time, at the edge of a large forest there stood a tiny cottage almost hidden by the trees. In it a little girl lived with her mother. The little girl could often be seen in her hood and red cape flitting among the tall trees. 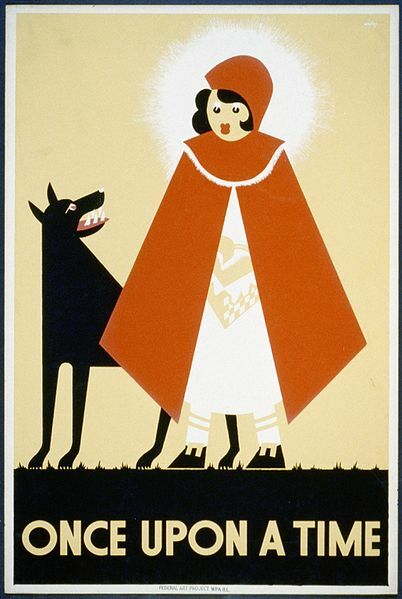 Her grandmother had made the hood and cape for her and because the little girl always wore them, she was called Little Red Ridding Hood. Red Riding Hood’s grandmother is old and feeble, caring and gift-giving, and lives within convenient walking distance (wolves not with standing) of her granddaughter. There are probably some grandparents who fit this image. There are probably even more who wish they matched some parts of it. But in today’s world, many grandparents are neither old nor feeble. They don’t eat chocolate cake or drink creamy milk especially when they’re sick. Their lives are not focused on their grandchildren but on their jobs, friends and social activities. Oh! We can’t forget that some of us can end up spending all day trying to figure out how to use our latest techie devices. Often they don’t live on the other side of the woods but on the other side of the country, on another continent, or at least somewhere where the winters are milder and the weather is sunnier. However grandparents are enjoying their beach cottages and mountain cabins. Aren’t they? One morning Little Red Riding Hood’s mother packed a basket full of homemade goodies that included a chocolate cake, a jar of strawberry jam and a bottle of creamy milk. She told Little Red Ridding Hood to take this basket to your grandmother because she was sick in bed and this food will do her good and it will make her happy. I would’ve preferred a cup of tea and a piece of toast myself. My friends and I didn’t realize how powerful myths could be until we became a grandparents. We have discovered that when it comes to the topic of family life how surprised we were to see how many people are still clinging to idealized images from the past. There’s certainly nothing wrong with having romantic and nostalgic ideas but if we walk around feeling that our lives are only second best because things were once better it can sap all our strength. And if we invest our energy trying to live the way we imagine people used to live we’re bound to be disappointed. Grandparents are living longer that in the first half of the century, the grandparenting phase might last two or three decades or more. In short, grandparenting has developed as an independent role in the family cycle and often extends as long or longer than parenting. Here are a few questions grandparents can ask themselves when choosing their grandparenting style. What kinds of things to you enjoy doing? What special skills do you have? How much time do you have available and how much do I want to spend grandparenting? What are your children’s and grandchildren’s needs? What religious and ethnic traditions do you want to pass on to your grandchildren? Keep in mind there is still no set definitions of what makes you a good grandparent any more that whats makes a good grandchild. The consensus about what makes us good grandparents makes it easier for each of us to reinvent grandparenting in own style and enjoy our roles.